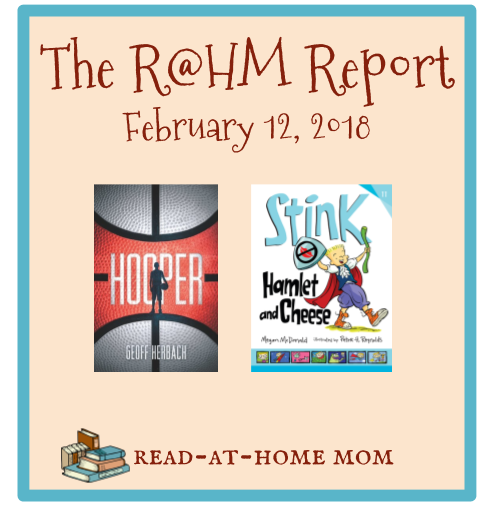 New picture books from Candlewick and a couple of Valentine-themed reads are in this week's Read-at-Home Kids Report. I read this book aloud to my two older girls (ages 2 and 4) after lunch for several weeks. It's really different from other animal stories, and well-written, and the illustrations are by the inimitable Maurice Sendak. (This was the first children's book he illustrated!) My review is scheduled for March 15th. A Family of Saints by Fr. Stéphane Joseph Piat, O.F.M. I am supposed to be reading this for my book club, but mostly I'm not doing it. Every time I try to get into it, my eyes just glaze over. I think it's too academic for me. It doesn't have enough of a hook or story arc to grab my interest. I am probably going to read a few excerpts so I don't have to skip the meeting, but I'm definitely not going to read the whole first half like I'm supposed to. I've been slow getting into this one, but so far, it meets the very high bar set by the first book of the series, All Creatures Great and Small. I expect to take a few weeks to finish this, but I'm sure it will be very enjoyable. I was listening to the audio version of this, but kept putting it aside in favor of podcasts, so now I'm reading the ebook instead. I'm enjoying main character Ellison's interactions with her sister, aunt, and police officer love interest as she tries to figure out who is trying to kill her. This is an ARC I downloaded from Edelweiss. (The book comes out in March.) It's a cozy mystery starring a 27-year-old woman who works in her parents' Chinese restaurant. I've just started reading, but I really love the author's writing style, and I'm already looking forward to the rest of the series. The Wonderful Farm counts toward the Old School Kidlit reading challenge, while Hamlet and Cheese fulfills letter H for the A to Z Challenge. Hard to Resist fulfills letter H for the Alphabet Soup Challenge, and it also counts toward the Library Love challenge. I also posted two reviews this week, which count for the Writing Reviews challenge: Jolly Foul Play by Robin Stevens and Clementine by Betsy Byars. Thanks for many new books to me! The Wonderful Farm sounds sweet and will look for the Hamlet and Cheese books for a young granddaughter! I love all your reading challenges! Death by Dumpling sounds like fun. Come see my week here. Happy reading! I'm adding Death by Dumpling to my wishlist. I love the cover of Death by Dumpling. Have a great week! I'm going to look for Death by Dumpling. I am a fan of cosy mysteries.